Which bike shop has the best bicycle mechanics in the city? Find out at the Bike Mechanic Challenge, a benefit for the Community Cycling Center. Mechanics from around the city will compete in a series of fun events in front of a live audience. 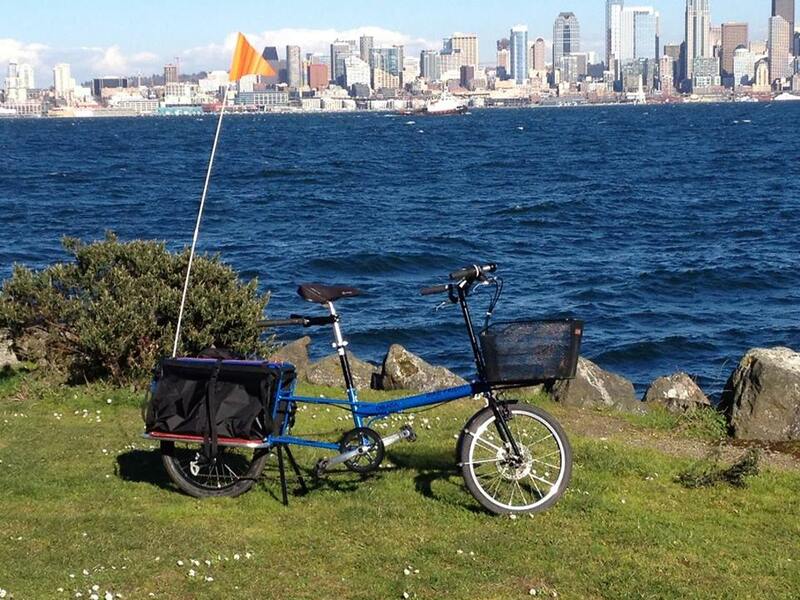 There will be food carts, beer, and a Bike Friday cargo bike raffle. If you want to see Portland’s best mechanics compete for one night only, come out to Velo Cult (1969 NE 42nd Ave., Portland OR 97213) on June 14th. The event will run from 6:30pm-10pm. Cheering and heckling are encouraged! Invite your friends on the Facebook event page. The Bike Mechanic Challenge is a friendly competition between bike shops in the city, put on by the Community Cycling Center to support our work of broadening access to bicycling and its benefits. Together, we are celebrating the many talented mechanics and bike shops in our fair city. 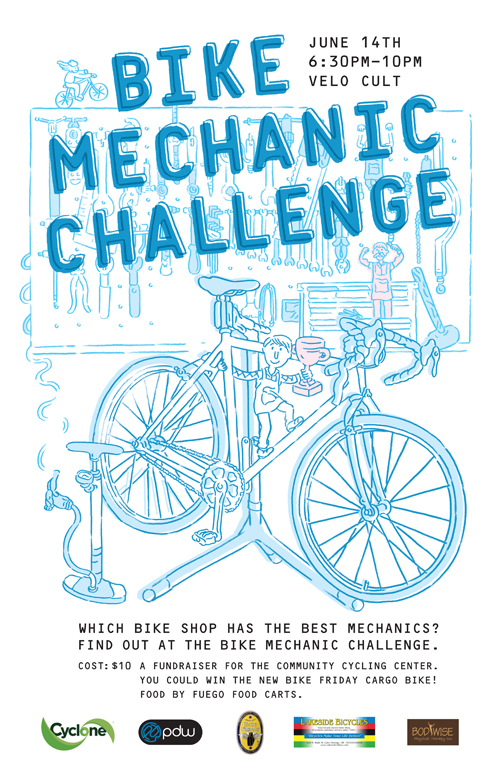 There is space for 10 bike shops to participate in the 2014 Bike Mechanic Challenge. It is open to any bike shop in the Portland Metro area. Bike shops need to send two mechanics to participate. Current participating shops include Bike Gallery, Western Bike Works, Lakeside Bicycles, Block Bikes, and more. Spots are going fast, so sign up quickly! The event is taking place on Saturday, June 14th, at Velo Cult from 6:30pm-10pm. Come out to see who the best mechanic is in all of Portland and enter to win the new Bike Friday Cargo Bike!! Food will be available from Fuego Food Carts and beer and other beverages can be purchased from the Velo Cult bar. Change front and rear brake cables. Two mechanics will work on the same road bike – one on the front brake, the other will work on the back (teamwork!). Mechanics will change front and rear cables; a team is finished when the cables are changed, and both wheels spin freely when the handbrake is released. Handlebar tape change on road bike. One OR two mechanics (teams choose) will remove existing tape from the handlebars and replace the tape (with plugs). Our judging panel will be looking for no gaps present and clean tape. Rear tire change on quick-release hub road bike. This event involves one mechanic, the other may advise but may not touch the work or the tools. There will be a surprise “twist” to this event. Mechanics will start with a full tire and tube on a road bike, remove the wheel, deflate the tube, remove the tire and tube from wheel, replace and inflate to 100lbs and replace on the bike. The wheel must spin freely. If a mechanic punctures the tube, they are disqualified. The final event will be a surprise, and there may be tie-breaking challenge questions that are knowledge-based. We can’t give it all away at once! The event itself will have an entry fee of $10 per person, with a discounted rate for bicycle industry workers of $5. The cost for bike shops to participate is a minimum of $50. There are varying sponsorship levels to add additional promotion for your shop. All event fees will benefit the work of the Community Cycling Center. Each bike shop will be promoted at the event as participants. The winner of the series will receive exclusive post-event publicity and prizes. Additionally, the winner will receive a trophy and 5% off their next order with Cyclone Bicycle Supply.